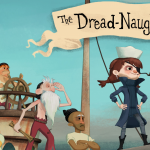 A particularly adorable puzzle game with a narrative about a fearless young girl who commands a crew of salty adventurers. How can you not fall in love with this game at first sight? The whimsical character design and nautical backdrop set the tone for the score, which captures the oceanic world with romantic era string writing and colors the characters with regional folk instruments like accordion and marimba. The score also brings in a cavalcade of hand percussion for race-against-the-clock hidden object puzzles and other frantic moments. In addition to the underscore there are a number of humorous songs (usually styled as sea chanties) which set the stage for each chapter in the adventure.